Hello everybody, it’s good to be back. Following on from my last post I am feeling better and have had my medication tweaked so fingers crossed for now. I don’t like to post negativity on my blog but I feel like I need to have a little bit of a moan about the book seller, Waterstones. More specifically, their online ordering system. I have a 9 year old son called James, who, like many other 9 year old boys, is obsessed with Minecraft. On the 28th of April this year, as a treat, I bought my daughter and son a book each that they had asked for. 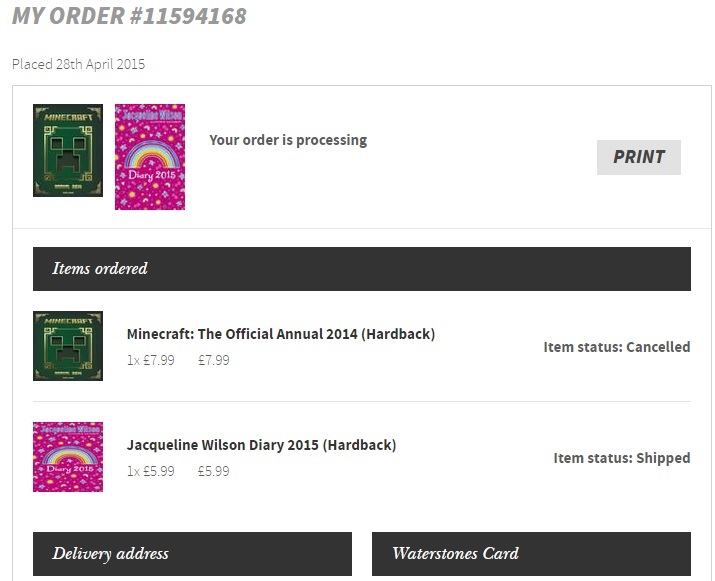 My daughter wanted a diary and James wanted the 2014 Minecraft Annual. When I ordered the annual, it said that it was in stock (obviously, or I would have ordered elsewhere). My daughters diary arrived withing a few days but the annual still had a status of ‘processing’. This continued for over 2 weeks with James asking excitedly every night if his Minecraft book had been delivered. I gave Waterstones the benefit of the doubt and assumed that they were simply awaiting the annual arriving from a warehouse or something along those lines. Yesterday evening I checked again on the status of James’s book and it had been changed to cancelled. I had no notification of this cancellation from Waterstones – as a matter of fact they have kept me uninformed throughout the entire process – and I have so far not received a refund! I am awaiting a response from Waterstones customer services regarding this matter. I am not concerned with the order being cancelled. What does concern me is the lack of communication, lack of refund and most importantly, a very upset little boy who has been excited for almost a month to receive his annual. I will say at this point that James is being assessed by CAMHS for suspected ASD. I only mention this to point out that James is prone to get obsessed and focused on certain things and cannot understand why now he cannot have something that has been promised for weeks and now believes he is being punished for something. I understand that these things happen, but to string my boy along for so long, instead of just saying on the website (like they do right now) that the product is unavailable, has caused many tears, confusion and upset. I really do not know if I can trust Waterstones again. Sorry for the negativity guys but I really had to say something.